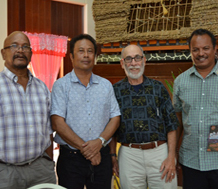 The Pacific Islands Climate Change Education Partnership (PCEP), led by WestEd and Pacific Resources for Education and Learning (PREL), is part of a national network of regionally and thematically based partnerships devoted to creating effective, high-quality education programs and resources related to the science of climate change and its impacts. As part of this national network funded by the National Science Foundation (NSF), PCEP focuses on how climate change impacts the coastal ecosystems that are vital to the lives and cultures of inhabitants of the Pacific Islands region. PCEP targets educators, students, and community members in a region that is among the most vulnerable to climate change impacts, including changes in weather patterns, sea-level rise, coastal erosion, coral-reef bleaching, ocean acidification, and contamination of freshwater resources by salt water. All of these impacts can cause great harm to local ecosystems and local communities. Other core partners in the PCEP include the University of Hawaii and the College of the Marshall Islands. Learn about Art Sussman's climate change education work in the Republic of Palau.